Customer journey maps help bring the focus of your business where it belongs: on your customers. After all, customers are twice as likely to talk about bad experiences as they are to talk about good ones, and it takes 12 positive reviews to make up for a single bad one. Since 86 per cent of buyers are willing to pay more for a better customer experience, that’s a pretty big deal. What may be the most compelling statistic, however, is that a mere five per cent increase in customer retention can increase profitability by a whopping 75 per cent. This is why customer journey maps are important. How can you get your hands on this tool that will help you focus on your customers? You create one. Great customer journey maps require data. Statistics such as the number of customers who find you through your website, order products online, and call into customer service are crucial to finding as many touch points as possible. But that’s not all you need to know. You must understand your customers on an emotional and intellectual level. What’s going through their minds when they search for your products? How do they feel when they tweet about your brand? How satisfied were they with that service call? To know all this, get personal with your customers. Surveys are a good start, but may not be enough because you can’t dig deeper when a response is vague. Focus groups help, too, but don’t allow you enough time with individual consumers. You need interviews. Once you do, you’ll have more than just data points. You’ll have real insights into the customer journey—and how to close the deal with more people. 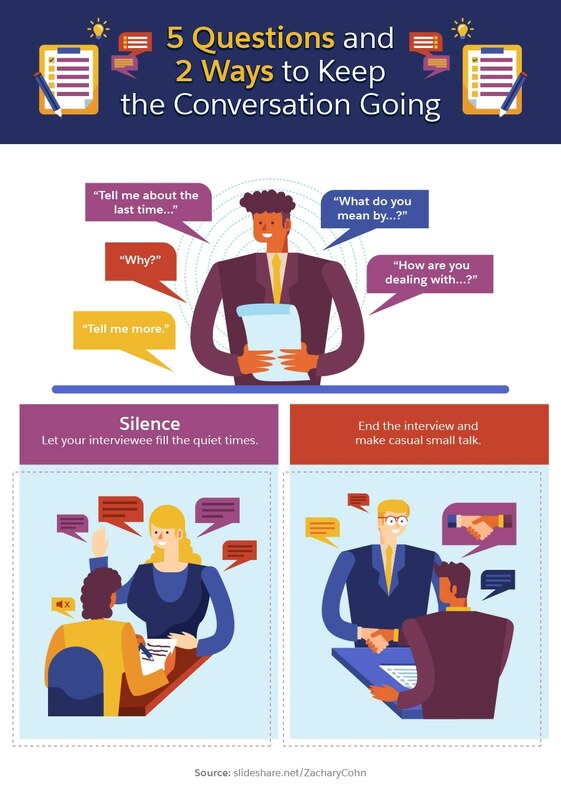 Before you recruit for interviews, you need to gather as much information as you have on the existing customer experience so you can know what to ask. Specific questions such as “How did you feel when you received that coupon from us?” are going to tell you much more than broad ones, including “Tell me about your experience with our brand.” In order to know whether to ask about coupons or phone calls or your website, however, you need some idea of whether or not those questions are even relevant. What kinds of customers buy online? Which come into the store? Who calls you on the phone? Before you interview your customers, create a preliminary journey map based on two types of information. Employee interviews tell you how individuals in your company see the customer journey, what touchpoints they already recognize, and where customers have already made their pain points clear. Create a preliminary journey map based on this information. Try to speak with both customer-facing employees and those in leadership positions in multiple departments so you get as full a picture as possible. Ask employees to imagine a customer’s goals and feelings at each step in the customer journey, and match that with what’s happening behind the scenes. Quantitative data helps you extrapolate the what and where of pain points in an objective way, without the colours of emotions your employees have when handling customer issues. This is where your CRM data will come in handy for things like traffic metrics, conversion rates, and purchase histories. Use it to refine your employee interview-based journey map. Now that you have a journey map based on your best predictions, it’s time to set up customer interviews. One of the most important factors in the accuracy of your journey maps will be who you choose to interview. Different kinds of customers have different experiences and touchpoints. Unless you’re currently focusing only on a niche market, you’ll probably need to create several different maps for different segments of your market. After all, if you create a single map that applies to every customer, you’re not going to learn much. 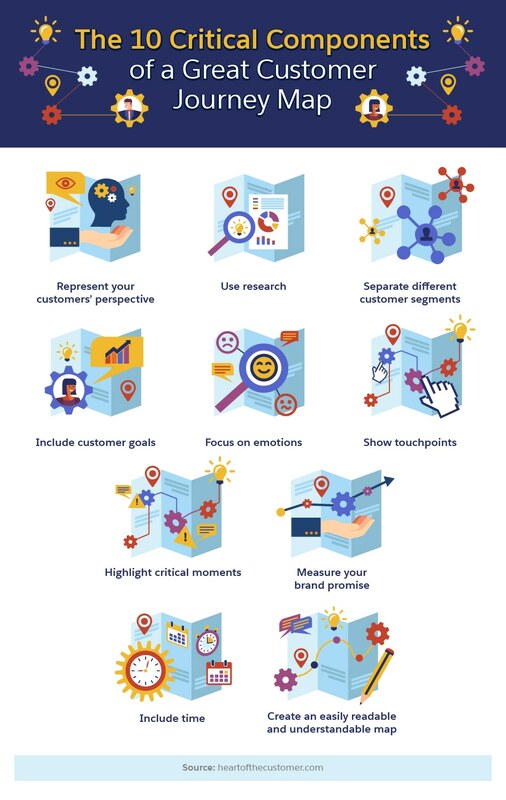 The point of a journey map is to drill down to incredibly personal goals and emotions, but be able to make changes that benefit much of your market. To begin, focus on one segment of your market. Gather enough interviewees from the segment (usually a dozen or more) so that common themes start appearing in the discussion. Then it’s time to sit down and interview them, one by one. Start with open-ended questions that inspire long, story-based answers—not a simple yes or no. Ask daily-life type questions, and try not to influence the answers. If a lawyer might stand up and say, “Objection! Leading the witness!” during an interview, back off and let the customer guide the conversation a bit more. Don’t be afraid to dig deeper when an answer seems vague or off track. Spend more time listening than talking, and note any phrases and keywords they use. In addition to helping you observe patterns, these will be useful for both SEO and improving your brand’s voice. How do you know what to ask about? That’s where your preliminary journey map comes in handy. Focus the conversation around the touchpoints you already know about. After a few preliminary questions, it’s okay to share your existing journey map with the interviewee. Ask them if the touchpoints you have line up with their experience. What are you missing? Are there touchpoints the interviewee didn’t experience? Are there steps in the customer journey (e.g., asking friends for advice) that don’t have a touchpoint with your brand? Once you agree on the structure, dig deeper. For each step in the customer experience, ask the interviewee about their goal in completing it. Is it to learn about a product or service, or is it to narrow down a choice of vendors? Ask about how the customer felt at each step. Dig deeper than simply good, bad, or neutral to get to emotions like excitement, frustration, confusion, or relief. 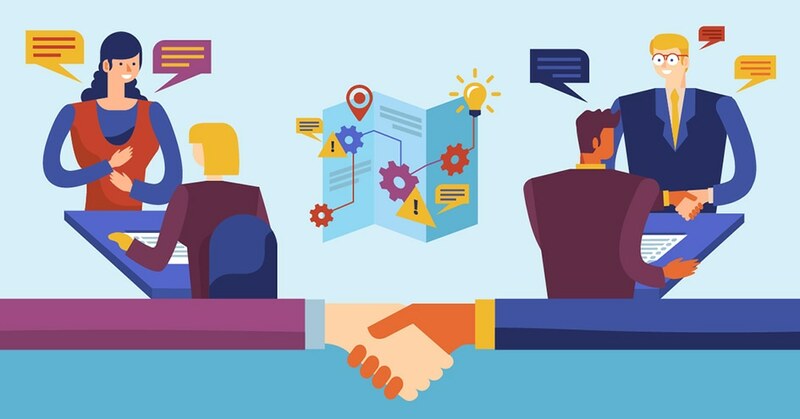 At many steps in the customer experience, the interviewee will interact with a person, object, or system associated with your brand, such as a salesperson, your website, or the product itself. Write down exactly who or what is responsible for each touchpoint. After this discovery process, ask your interviewee to choose which steps in the journey were the most frustrating or took the longest. This will help you prioritize which touchpoints you can improve. If the friction lies in a step where there is no touchpoint, perhaps adding one there would smooth the way. After a successful interview, organize your findings in meaningful ways. Jim Tincher, a Certified Customer Experience Expert, recommends using sticky notes during the interview process to help both you and your customers visualize the entire journey. Compare these findings to what you learned from other interviewees in the same market segment and look for patterns. Then complete your journey map and use it to improve your entire organization, starting with marketing and sales. Some of the very first steps on your customer journey will involve your marketing team. Let’s say your company offers tutoring services for high school students. Some parents will proactively look for tutoring services at the start of the school year; most, however, will only seek your company out if their children need additional help with their grades. If your customers find you through word of mouth, perhaps a testimonial or recruitment program could help you get more business. If a pain point seems to be the process of conducting research about your brand on your website, then a more visible or comprehensive FAQ page or blog posts aimed at answering their questions could be the solution. Get together with your marketing team to brainstorm solutions for improving touchpoints or adding new ones. Your sales team is responsible for turning the leads generated by marketing into conversions in the next part of your sales funnel. Touchpoints might include warm calling, point-of-sale interactions, and post-purchase follow-up calls. Search for pain points here. Look back at your data and see where leads tend to cut off communication as well. Work directly with your sales team to improve these touchpoints, but don’t be afraid to bring marketing in, too. Sometimes, setting leads’ expectations better in the marketing process can smooth the way for sales. While it’s tempting to end your improvements here, the customer journey stretches far beyond a purchase. Your interviews should also discuss the unboxing experience, product use over time, any service issues and how they were resolved, and additional purchases. Remember that every change you make to improve the customer experience brings your company one step closer to becoming a fully customer-centric business. Now that you have a map of one market segment, invest in journey maps for other segments. Keep in mind that the customer journey is constantly changing. Every improvement you make could alter other steps along the way, and changes in technology, the market, and your competition can all affect a customer journey map. Take the time to check back in with customers periodically with additional interviews. Your customers—and your bottom line—will thank you for your efforts.